Restaurant weeks, don’t you love them? I know I do. Philly is especially known (at least among the locals) for its restaurant weeks. This past September was Center City Restaurant Week and there will be another one Jan. 22 – 27 and Jan. 29 – Feb. 3, 2012. It is a wonderful time when you can enjoy wonderful deals on 3-course meals at the best restaurants in Philly. Usually lunch is $20 and dinner is $35. University City also celebrates food with Dining Days. Alas, not everyone is able to make it out to these wonderful weeks of the year. Your work schedule might not allow it, money might be tight or you might not live in Philly (a great reason to make a trip to this City of Brotherly Love). But do not fret, you can recreate some of the wonderful dishes served in your own home. 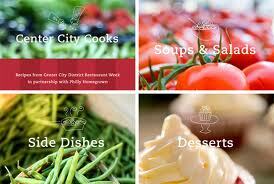 From the Center City Philadelphia web site (or here), you can download the free Center City Cooks recipe book. You will find 20 recipes from Garces Trading Company, Le Bec-Fin, El Vez, Porcini and other center city restaurants. What’s great is that it also includes a list of seasonal fruits and vegetables that are locally grown. If you want even more recipes, you can search for seasonal dishes that have been served at past restaurant weeks. I’ve already downloaded my copy and can’t wait to start putting my own twist on these dishes. Center City Restaurant Week is back! I hope you enjoy! I have yet to try any of these recipes, but I plan on doing so soon. Congrats on moving; I’ve always wanted to visit Stockholm.